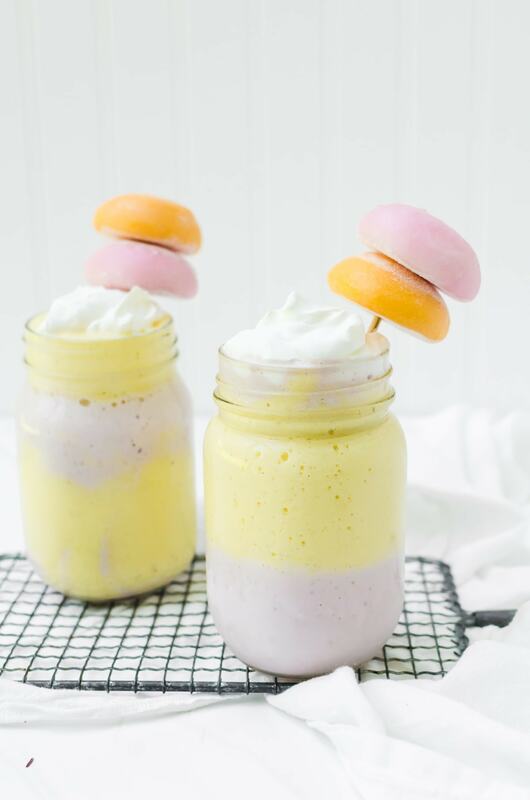 These sweet and colorful Strawberry-Mango Milkshakes are even more delicious than they look which make them the perfect treat for any girls’ night in, or soiree. 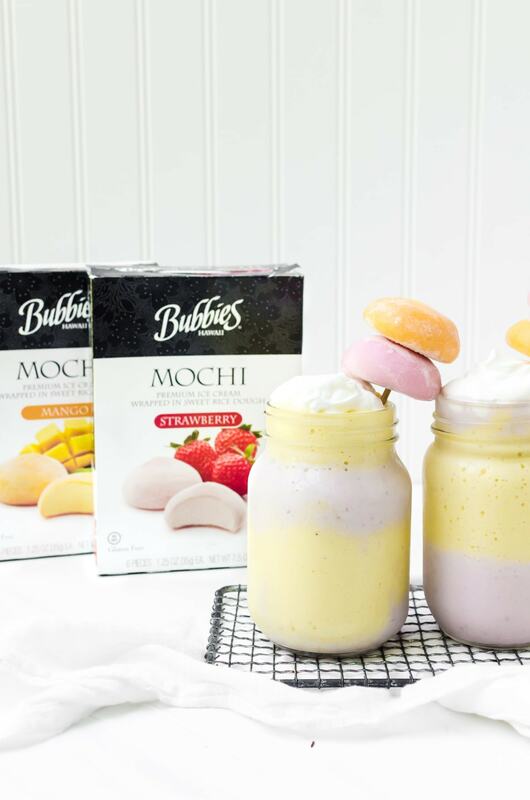 This is a sponsored post written by me on behalf of Bubbies Mochi Ice Cream. I’ve always been a firm believer that ice cream is not just a summer thing. I am the kind of girl who will whip up a milkshake or banana split any time of year. And why not? It’s not like I am sitting outside in the snow eating my ice cream like a loon. (By the way, if you do eat ice cream outside in the snow, more power to you and I totally did not mean that you are a loon, you beautiful human). That’s why I always keep my ice cream maker bowl in the freezer all year round. 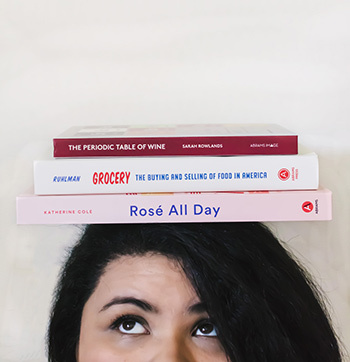 And why I am currently nibbling on a green tea Bubbies Mochi Ice Cream that I found at my local Whole Foods (and have a mango one lined up and waiting for me). 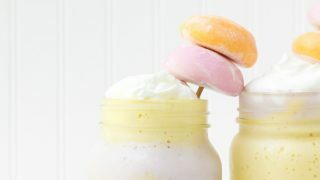 It’s also why we are taking a break from baking and sipping on a deliciously cream strawberry mango milkshake. 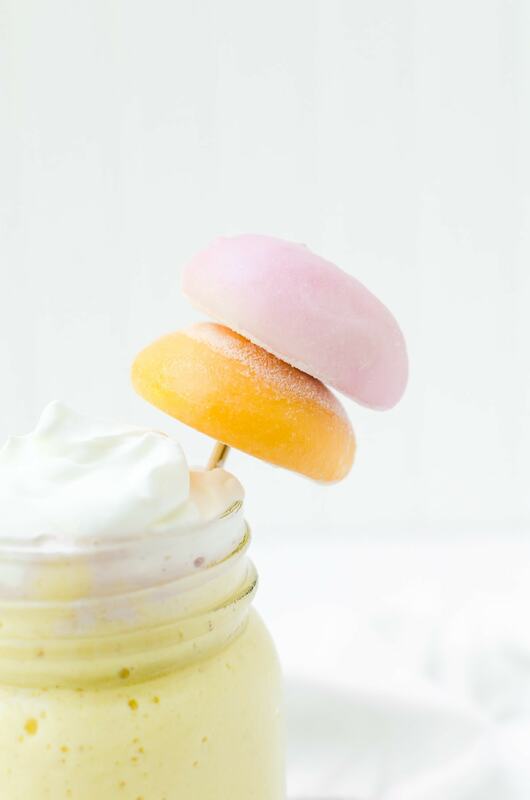 Let’s be honest, there is very little that’s more relaxing than hanging out with a milkshake with cute mochi ice creams as garnish anyway. 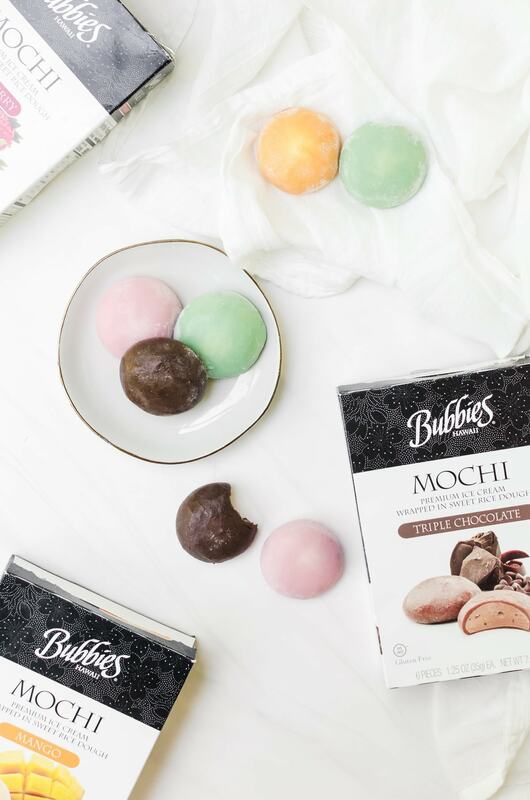 Bubbies Mochi Ice Cream is a bite-sized ice cream treat that comes in a variety of premium flavors. But what makes them “mochi” is that the ice cream is wrapped in a sweetened rice dough, making them not only bite-sized, but easy to hold. 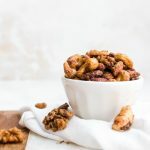 They’ve been one of my favorite treats since I was a child. My mother is from the Pacific Islands, so it was something she would buy for us regularly because they reminded her of home.Now, they remind me of being home as a child, too. I love them in the strawberry mango milkshake because it is an extra layer of delicious sweetness and I love the chewy rice dough. 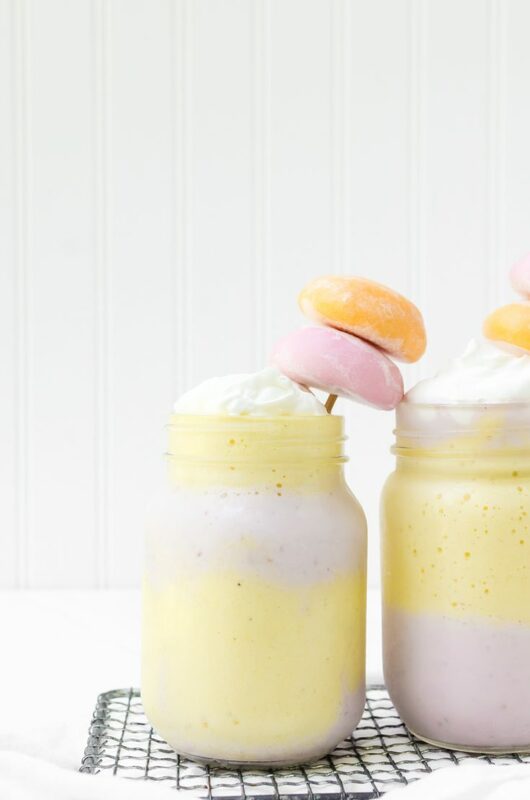 When making the layers in the milkshake, you need to make the strawberry and the mango milkshakes separately. Unlike other types of layered drinks, you don’t need to let one layer freeze a bit before adding another layer. Both layers are equally thick and layer very nicely together. I also sometimes like to take a skewer to swirl them a bit. Finish it off with some whipped cream. 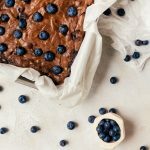 (I like to balance mine with unsweetened homemade whipped cream, but you can sweeten yours or even add more flavor to the cream itself!) 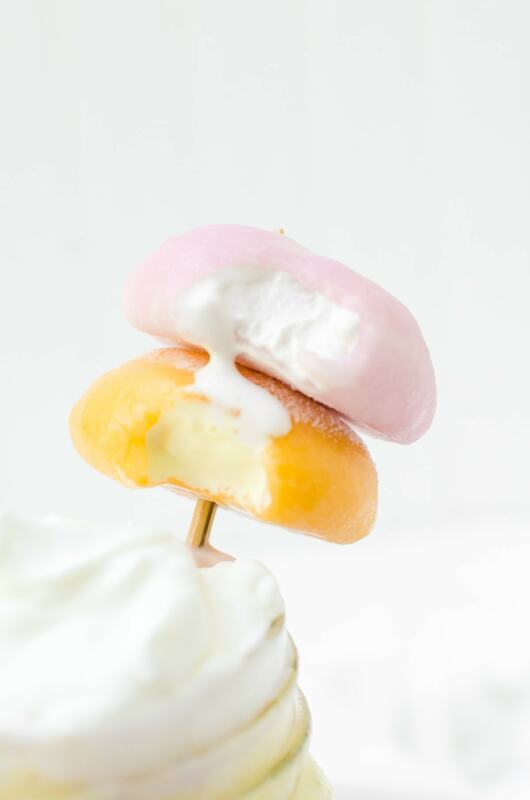 Top with a couple of mochi, and you have the perfect, cute treat for your group of gals. To make the strawberry milkshake: Blend the ingredients for the milkshake together in a high-speed blender, then transfer to a bowl. Set aside in the freezer. 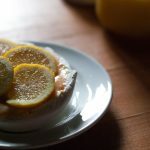 Quickly rinse out the blender (no need to fully wash it) and make the mango milkshake in the same way as the strawberry milkshake – add the ingredients to the blender and blend until creamy.